His flight will be powered by five tons of discarded packaging and waste collected from rubbish dumps and – using a pioneering technique – melted down into 1,000 gallons of aviation-grade diesel. 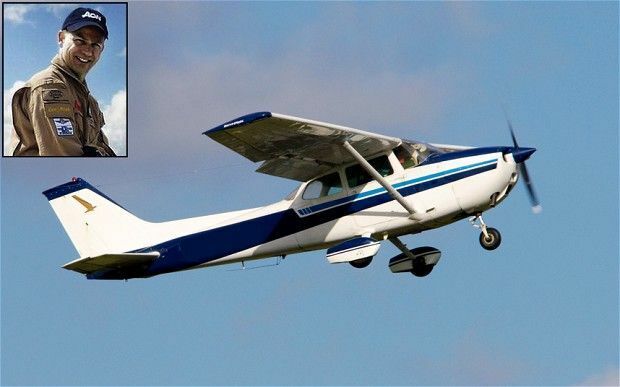 The 41-year-old will leave Sydney in July, flying over Asia, the Middle East and then Europe, and hoping to arrive in London six days later, after flying a single-engine Cessna 172 about 1,500 miles a day at a speed of about 115mph. To do this, he will have to fly for up to 15-hour stretches to reach his scheduled stops on time. He will travel at an altitude of 5,000ft – much lower than commercial airliners, which reach up to 40,000ft on long-haul flights. The fuel will come solely from so-called “end-of-life” plastic that cannot be recycled and would otherwise end up as landfill, including household waste such as packaging and wrapping. The plastic will be collected from the countries in which he is scheduled to stop along the way and shipped to Cynar, the Dublin firm that will help process the waste into aviation-grade diesel. Recent advances mean that it is now possible to distil plastic – most of which is petroleum-based – into fuel, using a process known as pyrolysis that does not pollute the air. The company says its plastic waste diesel fuel is cleaner than that used by most planes, its production process is cleaner, and it estimates a lower cost per gallon. Although it has been tested in cars, it is in the very early stages of aero engine tests and has never been used in flight. Mr Rowsell, a hobby pilot and insurance broker, decided to undertake the trip to raise awareness of new technologies that are exploring viable, environmentally friendly ways to fly, while also cutting down the amount of plastic waste in landfills around the world. “I saw the opportunity to link the British adventurous spirit and technological innovation of the early pioneers with similar challenges that face us today,” he said. But the flight will not be without its logistical challenges. Mr Rowsell, who was born in London but now lives in Australia, will have to battle the elements in a plane that is not designed for such long distances. He must also get the timing right on the stops where batches of the fuel will be positioned in advance. He will take food to last the challenge and use local accommodation near his landing points. His provisional route stops at 16 locations: Bundaberg, Darwin (Australia), Bali, Jakarta, Medan (Indonesia), Chang Mai (Thailand), Chittagong (Bangladesh), New Delhi (India), Karachi (Pakistan), Muscat (Oman), Abu Dhabi (UAE), Amman (Jordan), Cairo (Egypt), Rhodes (Greece), Nice (France), London. The weather will be hard to predict and he will have to negotiate several mountains at a dangerously low altitude. But he is also concerned about other, more unusual hazards: “When you’re flying as low as I will be, you are within the range of RPGs [rocket-propelled grenades] and you can’t plan for being shot down mid-air. Mr Rowsell, who is married with two children, is an experienced pilot who has flown aerobatics, volunteered for the Royal Flying Doctors service and has already made a number of high-risk flights in single-engine aeroplanes. So he is aware of the dangers of such technically difficult challenges – some of his aviation heroes died undertaking similar flights in single-engine planes. Sir Charles Kingsford Smith, a First World War pilot and aviation pioneer who set the record for the Sydney to London trip in 1933, disappeared in the sea on a flight from India to Singapore in 1935; Bert Hinkler, who made the first solo flight from England to Australia in 1928, crashed in the mountains of Italy five years later. Mr Rowsell has prepared for all eventualities on the trip and has practised everything from what to do if his plane comes down in water, to crash simulations, wilderness training and even a kidnapping. He said: “The early pioneers have taught me a great deal. Many of the pilots truly believed aeroplanes could benefit the human race and fought to prove the technology. "As they pushed the boundaries of technology in their day, so is this flight today.